The increasing demands for high fiber counts and limited cabling space in today’s data centers have driven the evolution of multi-fiber technology. MPO/MTP technology with multi-fiber connectors serves as a practical optical solution to support high network performance in data centers to accommodate the current and future requirements. Many MPO/MTP products are available in telecommunication market, like MPO/MTP fiber cables, MPO/MTP cassettes, MPO/MTP connectors. This article will introduce MPO/MTP cable assemblies and solution in data centers. The term MTP is a registered trademark of US Conec used to describe their connector. MTP cable assemblies are designed and introduced as a performance version of MPO connectors. MTP does interconnect with the MPO connectors. Each MTP connector contains 12 fibers or 6 duplex channels in a connector that is smaller than most duplex connections in use today. A 72-fiber trunk cable can be terminated with six MTP connectors. MPO/MTP fibers are manufactured with outstanding optical and mechanical properties, allowing high-density connections between network equipment. When easy insertion and removal of a MPO/MTP fiber is required, just a simple push-pull latching mechanism is used in manufacturing MPO/MTP patch cord. That is called Push-Pull tab MPO patch cord. This kind of MPO patch cord with Push-Pull tab offers maximum accessibility in high-density installations, easy insertion and removal with only one hand. MTP brand cable assemblies are multi-fiber patch cords suitable for high-density back plane and PCB solutions. There are mainly two configurations for MTP cable assemblies. The most commonly-used one is a MTP connector to MTP connector trunk cable that connects a MTP cassette to another MTP cassette. The other one is MTP connectors to LC or other connector. MTP trunk cable, as a permanent link connecting the MTP modules to each other, is available in 12-144 counts, intended for high-density application. Using MTP trunk cables, a complete fiber optic backbone can be installed without any field termination. MTP fan-out cables, also known as harness cables, provide connection to equipment or panels that are terminated with ST, SC connectors. Such assemblies are available pre-wired into patch panels and wall enclosures, able to meet a variety of fiber cabling requirements. MPO/MTP cable assemblies are suitable for high-density switch to patching and distribution in data center applications. Their compact design addresses high fiber count applications with small and lightweight cables ideal for applications in which installation space is limited. 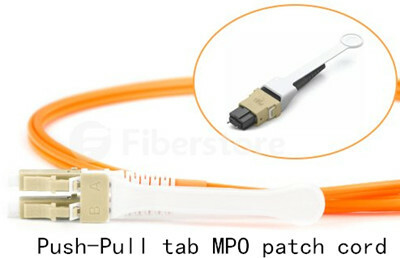 Besides, the MPO/MTP connector is the standard for delivery of 40G (in its 12 fiber version) and 100G (in either a duplexed 12 fiber cable or 24 fiber ferruled cable) using QSFP transceivers. 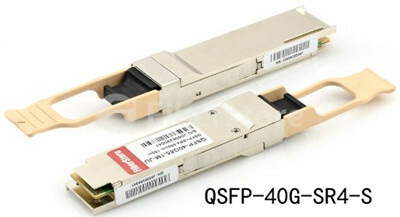 In 40G applications, take QSFP-40G-SR4-S for instance, this Cisco QSFP-40G-SR4-S QSFP+ transceiver establishes 40G links with the 12 fiber MPO connector assembly. As a leading fiber optical product manufacturer and supplier, as well as a third party, FS.COM follows customers closely to understand their taste and better meet their requirements. FS.COM supplies high quality MPO/MTP assemblies available in both single-mode and multi-mode versions, in trunk and fan-out types, which are sold at the competitive prices. Besides, Push-Pull tab MPO patch cord (one type of Push-Pull patch cords), which allows easy installation and removal of cables, can also be found in FS.COM. MTP/MPO cable assemblies help customers to save time, space and cost, while providing high density, suitable for data centers, telecommunications, and broadcast communication applications. In FS.COM, you find the right MTP/MPO cable assemblies for your network performance. Additionally, these products can also be customized upon your request. You can visit FS.COM for more information about MTP/MPO cable assembly solutions.